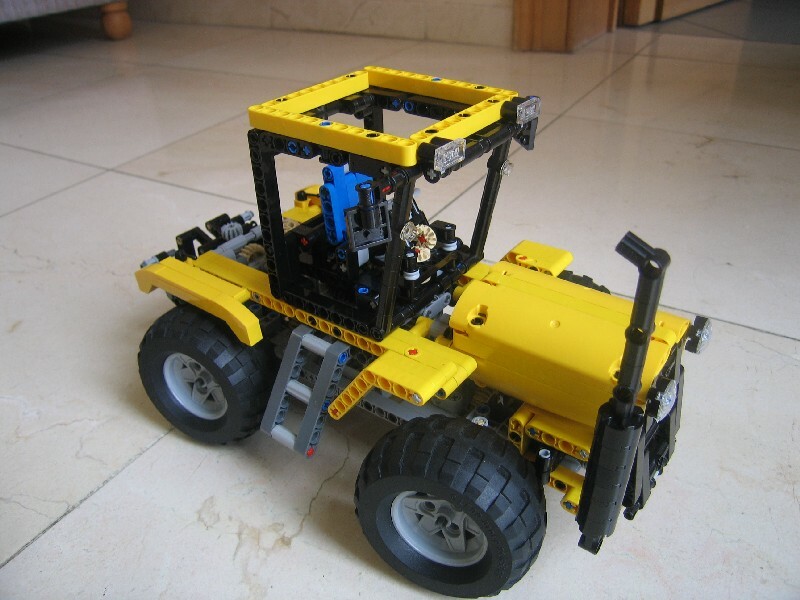 A few weeks ago, GuiliuG (or lego7777777) presented at EB a full featured Xerion 4500 tractor. It has no motorized Power Functions, but instead a very interesting set of manual functions, well packed inside its body and scale. A beauty lets say! IMO what it is most interesting in this model, is the building style and some of the techniques applied which I find quite close to the "official" way of building, as actually in use by the LEGO Technic designers. Manual Crab steering with powered steering wheel. Full rotating cabin, despite not exactly as in a real Xerion 4500 . Coupler leveling for trailers fit, with transmission to drive eventual trailer functions. Hood raises to unhide an Inline-four engine. Then it is also plenty of aesthetic details very well integrated in the model and never exaggerated. The rear wheels mudguards are just one good example of it. Off course the most distinctive element (despite not original) is the solution used to control all the crab steering functions with a single joystick mechanism. See how from the video below and author's photos at Brickshelf. A very nice detail is also the powered steering wheel, which unfortunately we haven't seen anymore, into LEGO Technic official sets. You may also find a specific sequence of reversed order photos at Brickshelf, that will help you in case you want to build this by yourself, or better understand the functions and mechanisms. The functions (especially the ways of steering) are very nice, but the appearance hardly looks like a Xerion. Wrong proportions (too high, too wide) and wrong colouring.